Lower left: "J Sorolla. B 1909"
The colored reflections of late afternoon light animate this beach scene and actively define the forms, from the injured child's shoulder to the liquid sea and the figures playing in the water. The sun's highlights on the hurt child's hand, the sand around her foot, and her companion's hat draw the viewer's attention to the injured limb. While on the beach at Valencia,Joaquín Sorolla y Bastida rapidly painted a group of pictures including The Wounded Foot. Like the Impressionists before him, Sorolla worked outdoors to capture the momentary effects of light, water, and people in motion. This painting's casual snapshot-like cropping, which cuts off the arm of the child at the left, gives the viewer the same sense of immediacy, as if he or she has accidentally happened upon an impromptu exchange between two children on the sand. Doménech, Raphaël. Sorolla: Sa vie et son oeuvre (Madrid: Léonce Miguel, 1910), pp. xxxviii, 80, fig. 105. Catalogue of Paintings by Joaquín Sorolla y Bastida under the Management of the Hispanic Society of America, February 14 to March 12, 1911, exh. cat. (Chicago: The Art Institute of Chicago, 1911), unpaginated, no. 27, ill.
A Collection of Oil Paintings by Joaquín Sorolla y Bastida, under the Auspices of the Hispanic Society of America, exh. cat. (St. Louis: City Art Museum, 1911), pp. 31, 44, no. 26, ill.
"Bellas Artes. Cuadros de Sorolla." Betica 3, no. 39 (August 15, 1915), unpaginated, ill.
American Art Association, New York. Gothic and Renaissance Art: Collection of the Late Thomas Fortune Ryan. November 23-25, 1933, p. 84, lot 274. Pantorba, Bernardino de. La vida y la obra de Joaquín Sorolla: Estudio biográfico y crítico (Madrid: Editorial Mayfe, 1953), p. 188, no. 1711, pl. 93. Pantorba, Bernardino de. Sorolla: Estudio biográfico y crítico (Madrid: Compañía Bibliográfica Española, 1963), p. 65, ill. between pp. 96-97. Pantorba, Bernardino de. 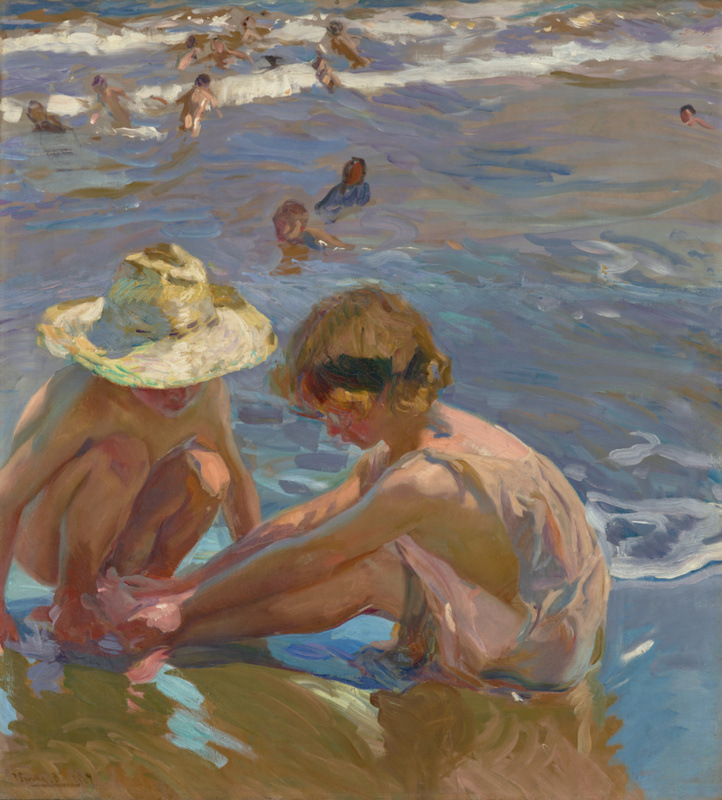 La vida y la obra de Joaquín Sorolla. 2nd ed., rev. (Madrid: Extensa, 1970), pp. 79, 194, no. 1711, pl. 101. Pantorba, Bernardino de. Sorolla: Estudio biográfico y crítico. 2nd. ed. (Madrid: Aldus, 1977), p. 65, ill. between pp. 96-97. Fredericksen, Burton B., Jiří Frel, and Gillian Wilson. Guidebook: The J. Paul Getty Museum. 4th ed. Sandra Morgan, ed. (Malibu: J. Paul Getty Museum, 1978), p. 93. Thunissen, Marie-Anne, et al., eds. Sorolla / Solana, exh. cat. (Liège: Salle Saint Georges, 1985), pp. 85, 174, no. 23, ill., cover ill.
Jaffé, David. Summary Catalogue of European Paintings in the J. Paul Getty Museum (Los Angeles: J. Paul Getty Museum, 1997), p. 119, ill.
Walsh, John, and Deborah Gribbon. The J. Paul Getty Museum and Its Collections: A Museum for the New Century (Los Angeles: J. Paul Getty Museum, 1997), p. 25, ill.
Pons-Sorolla, Blanca. Joaquín Sorolla: Vida y obra (Madrid: Fundación de Apoyo a la Historia del Arte Hispánico, 2001), pp. 327, 331, fig. 197. Pons-Sorolla, Blanca. Joaquín Sorolla (Barcelona: Ediciones Polígrafa, 2005), pp. 208, 210, fig. 105. Pons-Sorolla, Blanca. "Preparing the 1911 Exhibitions." In Sorolla and America, exh. cat. Blanca Pons-Sorolla and Mark A. Roglán, eds. (Dallas: Meadows Museum, 2013), p. 30, fig. 9. Pons-Sorolla, Blanca. "Paintings Sold and Portraits Painted in America, and Portraits Painted in France for Americans: Not Included in the Exhibition." In Sorolla and America, exh. cat. Blanca Pons-Sorolla and Mark A. Roglán, eds. (Dallas: Meadows Museum, 2013), p. 313, no. 186, ill.
Pons-Sorolla, Blanca. "Seas and Beaches in the American Exhibitions of 1909 and 1911." In Sorolla and America, exh. cat. Blanca Pons-Sorolla and Mark A. Roglán, eds. (Dallas: Meadows Museum, 2013), p. 155. Pons-Sorolla, Blanca. "Preparando las exposiciones de 1911." In Sorolla y Estados Unidos, exh. cat. Blanca Pons-Sorolla and Mark A. Roglán, eds. (Madrid: Fundación Maphre, 2014), pp. 33, 34-35, fig. 15. Pons-Sorolla, Blanca. "Introducción." In Sorolla y Estados Unidos, exh. cat. Blanca Pons-Sorolla and Mark A. Roglán, eds. (Madrid: Fundación Maphre, 2014), pp. 182, 186-87.